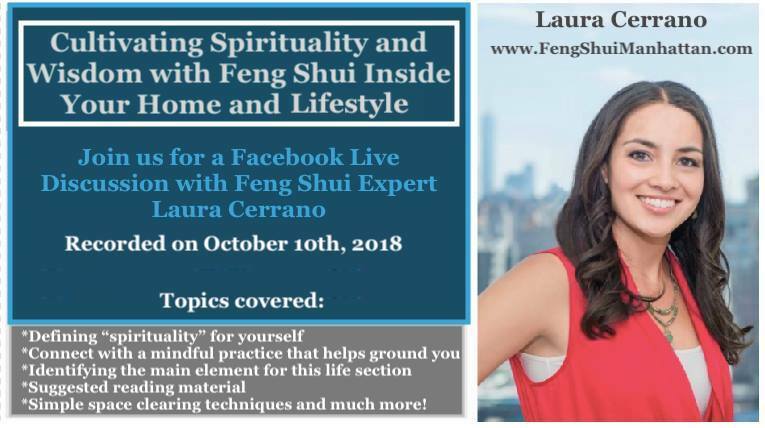 During this Feng Shui Manhattan Facebook Live talk, Certified Feng Shui Consultant Laura Cerrano explored practical approaches on how to welcome the energy of wisdom, knowledge, and spirituality into your home and lifestyle. 1. "Women who Run with Wolves," by Clarissa Pinkola Estes, Ph. D.
Laura also touched upon the topic of intention writing. For those of you who are not familiar with the word “intention,” or would like to enjoy a quick refresher, please visit: What Is The Most Important Principle in Feng Shui? What is the Most Important Principle In Feng Shui? It must be furniture arrangement? How about color and artwork selection? Is it understanding what elements I’m born with? Or, perhaps it’s the direction my home faces? First, lets translate “Feng Shui” into a more digestible meaning. Feng Shui = a lifestyle of self-development & spiritual-development. Adopting the lifestyle of Feng Shui awakens your understanding that change first and foremost, begins from within. Exploring the inner alchemy of one’s self and becoming consciously aware that YOUR INTENTIONS provide the starting point for internal and external transformation is extremely important. Let’s take a look at the word, Intention through the teachings of Gary Zukav, author to, “The Seat of The Soul,” published in 1981. Intention is created by a thought. A thought is energy that has been created by consciousness. Consciousness is choosing to be awakened and aware of one’s internal and external surroundings. You give your intention form based on the way you feel, think, behave, your values and how you choose to live your live. This single word, encompasses so many possibilities in how your life could be directed. If anything that you learn from the teachings of Feng Shui, remember change begins with you, “the man in the mirror.” Become CLEAR with your INTENTIONS (your motivations), for why you are purposely asking to CHANGE YOUR LIFE. From your internal responses, this now introduces self-discussion about which Feng Shui method or methods you would like to utilize during the external transformation process of your living and working environments. Changes may include the architectural design of a building, the floor plan layout, selection of land to occupy, selection of artwork, colors, objects, and furniture arrangement that best align with your personal intentions and astrological birth chart.